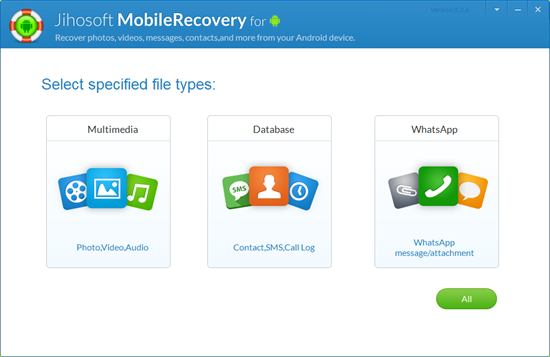 Jihosoft Android Data Recovery is the most powerful software that can restore deleted or lost contacts, photos, videos, audios, SMS, call logs, WhatsApp chat, Viber messages from Samsung, HTC, LG, Huawei, Motorola, Nexus, etc. In the mean time, you will be guided step by step if you never used this app before.What\'s new in this version:1. Newly added Viber data recovery.2. Support all the newly android device, such as Samsung S7, Samsung S7 edge.3. Support Windows 10.4. Recover data with better efficiency and faster speed.Advantage1. Restore Viber data as most recovery app can not do that.2. Retrieve various data no matter how you lost files. Such as deletion, formatting, OS update, virus attack, ROM flashing, etc.3. Restore data with 100% security.Disadvantage1. It will take a while to scan. Yet, it worth for waiting as it will find out your lost data.2. Paid software. Slicksync Office Synchronizer Pro makes it easy to synchronize your Word, Excel, Outlook, PowerPoint and Access files to a local, network or removable drive! You can use Devexec to run a process under SYSTEM, NETWORK_SERVICE, TrustedInstaller in an interactive session. It is even possible to run a process under domain account without specifying its password! Award winning, easy-to-use benchmarking software for Windows. It tests all of the computer\'s subsystems and provides benchmarked comparisons between the test PC and other standard baselines downloadable from the PassMark website.